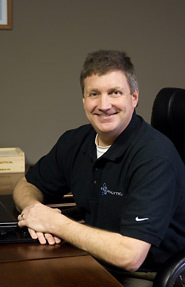 Craig, formerly the president and founder of Decision Support Analytical , Inc., joined KD in May 2007. 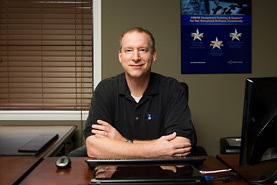 As vice-president, Craig oversees operations, marketing and sales. Craig is directly responsible for the Commercial Training and Support Group. He brings more than twenty years of analytical experience to KD During the last ten years, Craig has been concentrating his efforts on training, analyzing and supporting high end analytical equipment around the globe; which includes the INFICON HAPSITE® GC/MS and the Smiths HazmatID® . In addition to hundreds of field projects, Craig has published and/or presented over 30 papers on Field Analysis. Before KD and Decision Support Analytical, Craig was President of Field-Portable Analytical, Inc, where he collaborated with INFICON to achieve EPA’s ETV Verification on the HAPSITE® and successfully received certification of the HAPSITE® from the State of California. Prior to his field experience, Craig spent ten years providing laboratory analysis by GC and GC/MS for Air Toxics Limited, Inc., which included five years as Lab Manager and Marketing Director. Throughout his career, Craig has been devoted to working with manufacturers, regulators and customers to integrate and promote the latest analytical technologies into mainstream projects. Craig received his B.S. in Chemistry from Eastern Kentucky University in Richmond, KY.
Patrick recently joined KD Analytical as Vice President in February 2011. As VP, Pat is responsible for the Sales and Marketing effort within KD, to continue the aggressive growth that KD had experienced over the past several years. He brings nearly 30 years of analytical detection experience to KD, with more than 25 years in sales; with 20 of those years focused specifically on field detection technologies. Most recently, Pat served as the Senior Vice President of Detection Sales for FLIR Systems (formerly ICx Technologies), one of the leading companies in the development of Homeland Security Detection technologies, where he managed the sales group. 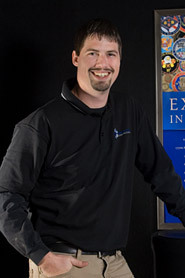 Prior to ICx, he was responsible for the DOD and Federal Sales Team at Smiths Detection. Right out of school, Pat started his career in the analytical laboratory. Pat broke into the field of analytical technology sales with Viking Instruments who manufactured one of the first man-portable GCMS systems. Following Viking, he was the top salesman for INFICON, pioneering their presence in the DOD responder community. Pat received his B.A. in Chemistry from the University of New Hampshire in Durham, NH. 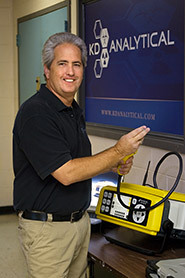 Pat’s past experience and efforts have linked him closely with groups like KD to develop world class capabilities for training and technical support for high end field analytical equipment around the globe; which includes the ICx identiFINDER®, Smiths Detection HazMatID® and INFICON HAPSITE® GC/MS. Jon joined KD Analytical in June 2007. As the Director of Operations, Jon oversees the activity, execution and management of all KD Analytical support contracts. 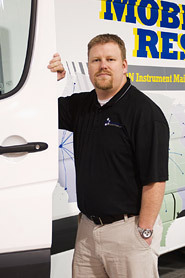 Jon is also directly responsible for all day to day operations at KD’s Technical Support Facility located in Lexington, KY. Prior to his current duties, Jon was responsible for regional support operations for National Guard Bureau’s Civil Support Team (CST) program within KD Analytical. Prior to joining KD Analytical Jon was responsible for all field and site investigations including soil, water and soil gas by Bas Chromatography/Mass Spectrometry (GC/MS) and Direct Push Membrane Interface Probe (MIP) analysis using a variety of detectors. Jon directed new research for expanding the use of MIP and provided consulting support to MIP operators. Jon was a member of the Direct Image Group within Geoprobe® Systems where he worked with the full suite of EC, CPT, HPT and MIP sensing systems and conducted trainings and workshops all over the US and in several foreign countries. Jon gained extensive experience in analytical chemistry with an environmental laboratory, Continental Analytical Services. Jon earned his BS in Chemistry from Kansas Wesleyan University in Salina, KS. Shaun joined KD in May 2006. He is responsible for all training provided by KD Analytical. This includes commercial off the shelf; FT-IR, GC/MS, and USARMY green gear training as well as the integrated use of these technologies for unknown sample detection. Before focusing on training, Shaun managed operations for KD Analytical’s Technical Support Group for the National Guard Bureau’s Civil Support Team (CST) Program. This included routine and after hour support by phone and website, as well as tier based instrument maintenance for the CST Program. Prior to KD Analytical, Shaun provided field analytical services using portable GC/MS systems for Sentinel Mobile Laboratories. He also developed protocols and conducted extensive Indoor Air Quality analysis utilizing a variety of indoor air instrumentation including GC/MS. He also has worked in the process food industry analyzing impurities by GC/MS. Shaun received his BS in Chemistry from Saint Anselm College in Manchester, NH. Tim joined KD Analytical in June 2011 with a role of leading our Chemical, Biological, Radiological, Nuclear, Explosive (CBRNe) Building and Critical Infrastructure Protection activities. Tim will be managing and executing our vendor-neutral, CBR-agent focused risk-based TVPAs, CBR agent detection, CBR agent building protection, biosecurity, systems design, facility certification and integrated Anti-Terrorism/Force Protection (AT/FP) related design and technical consultation services to include providing the necessary application, construction, installation, integration, testing, commissioning, operations, maintenance, troubleshooting and training related services, as well as the ConOps related developmental assistance and systems optimization related services necessary for critical mission facility applications. Tim is a Certified Protection Professional (CPP) and certified risk-assessment professional, and mechanical engineer with over two decades of experience in providing a wide range of risk-based TVPA, CBRNE detection and CBR agent building protection, biosecurity, AT/FP, electronic security, biometrics, infrastructure protection and building automation systems assessment, design, application, construction, fabrication, installation, integration, testing, commissioning, operations, maintenance, troubleshooting and systems optimization related services necessary for a multitude of critical mission facilities in the Special Nuclear Material (SNM) processing, chemical processing, BSL-2, BSL-3 and BSL-4 laboratory, military base, Departmental Headquarters and critical mission command center arenas. 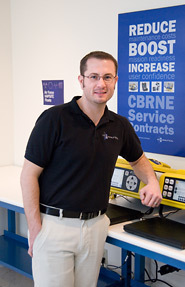 Prior to joining KD Analytical, Tim served as Vice President – Protection Technology for FLIR/ICx Technologies, Director of Engineering – CBR Agent Building Protection / Biosecurity for Johnson Controls and Program Manager / Senior Research Scientist for Battelle Memorial Institute, among other positions. Tim has completed 30+ post-graduate certification and training courses at the Harvard School of Public Health, the University of Wisconsin, California University of Pennsylvania, Savannah River Site and Sandia National Laboratories, among others. He received both an A.S. and a B.S. in Mechanical Engineering from the University of Wisconsin. Dan’s responsibilities include field operations for environmental projects using Gas Chromatography/Mass Spectrometry (GC/MS) instrumentation. 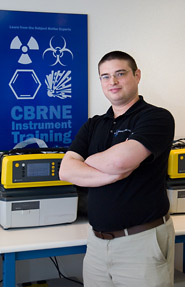 Dan is also in charge of KD Analytical GC/MS rental program. 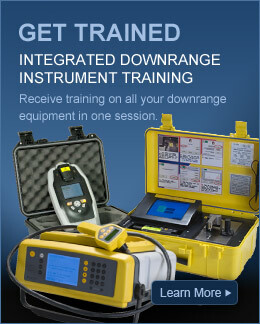 He does the training, method development, and maintenance for all of the equipment. This also includes development and testing of PAT rounds (Performance Analytical Test). Prior to KD Analytical, Dan was employed at a field portable laboratory for over 13 years, and was in charge of environmental projects using GC and GC/MS instrumentation. This included Superfund sites analyzing water, soil, and soil gas. He also worked with many chemical factories all over the United States and Puerto Rico testing for chemical pollutants, and process optimization. Prior to that, Dan was a regional manager in charge of a large chain of stores for 15 years where he learned all of his management and marketing skills. 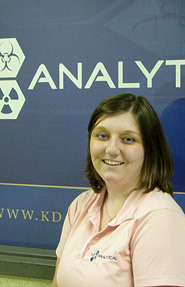 Marnie is the quality assurance/quality control manager for KD Analytical. She leads and initiates activities to ensure maintenance of the quality system and compliance with ISO 9000. Marnie also tracks the status of all documents pertaining to the commercial off the shelf (COTS) instrumentation, managing the creation of new documents and the review of current documentation. 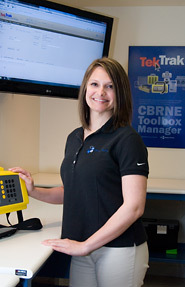 In addition, she coordinates the development of ReadiTrak™, KD Analytical’s web-based tool for quick and efficient management of CBRNE equipment. 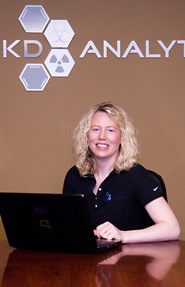 Prior to KD Analytical, Marnie worked at Lexmark International performing materials analysis and optimizing manufacturing processes. She also worked at an OnSite Environmental, testing soil and water sample for trace metal content using preparation methods including microwave, hot plate and alkaline digestion followed by analytical analysis through ICP and ICP/MS. Marnie received a BS in Biochemistry from Grove City College in Grove City, PA and a MS in Medical Sciences from the University of Kentucky in Lexington, KY.
Jeremy is responsible for all repair and preventative maintenance actions to commercial off the shelf (COTS) equipment utilized by the National Guard Bureau’s Civil Support Teams (CST). He ensures that each repair is completed correctly and efficiently. Jeremy is also responsible for generating necessary documentation to ensure that KD Analytical continues to provide current and accurate technical support to the CST teams. Jeremy has over ten years experience in various scientific procedures. In the summer of 2003, Jeremy was a lead researcher at a bioremediation site in Tulsa, Oklahoma where he worked with other researchers from the University of Tulsa to resolve a large iron mining pollution problem. Jeremy received a MS in Biology from Eastern Kentucky University and a BA in Biology from Transylvania University. Nealia is responsible for the Preventative Maintenance Checks and Services (PMCS) of different equipment types utilized by the Air Force, including GC/MS (HAPSITE®) and FTIR (HazMatID). 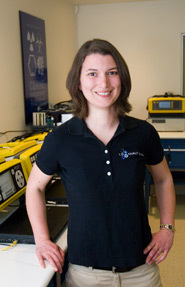 She also aids in the troubleshooting and repair of the analytical instrumentation. Prior to KD Analytical, Nealia worked as a quality control technician at Sherwin Williams Automotive Plant in Richmond, KY. Utilizing bench top GC/MS and FTIR instrumentation, she collected chromatograms and spectra to help match paint standards. Nealia received her Bachelor’s degree in Chemistry from Eastern Kentucky University in 2007. Jed is responsible for ensuring the National Guard Bureau’s Civil Support Teams (CST) commercial off the shelf (COTS) instruments are functioning properly through corrective and preventative maintenance actions. Jed also has the responsibility of composing documentation that is necessary for KD Analytical to provide excellent and accurate technical support to the CST community. Jed is trained as a Hazardous Materials Technician and has successfully completed the Analytical Laboratory System (ALS) Operator course. Prior to joining KD Analytical, Jed worked as a Research Chemist at LexMark International, where he formulated urethane mixtures and conducted spray coating experiments, implementing several new Standard Operational Procedures. Jed received his Bachelor’s degree in Chemistry from Eastern Kentucky University in May of 2004. Linda is responsible for the Preventative Maintenance Checks and Services (PMCS) of all analytical equipment utilized by the National Guard Bureau’s Civil Support Teams (CST). She also aids in the troubleshooting and repair of the analytical instrumentation as well as writing documentation that is necessary for KD Analytical to provide excellent and accurate technical support to the CST community. Prior to KD Analytical, Linda served in the United States Marine Corps as an Aviation Ordnance Technician where she performed duties as a Quality Assurance Safety Observer and Collateral Duty Inspector ensuring the safe loading and maintenance of aircraft. Linda received her Bachelor’s degree in Forensic Science with a concentration in chemistry from Eastern Kentucky University. Schavon is responsible for the Preventative Maintenance Checks and Services (PMCS) of all analytical equipment utilized by the National Guard Bureau’s Civil Support Teams (CST). 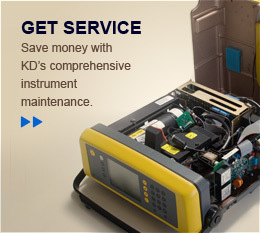 She also aids in the troubleshooting and repair of the analytical instrumentation as well as writing documentation that is necessary for KD Analytical to provide excellent and accurate technical support to the CST community. Prior to KD Analytical, Schavon worked for Target for nine years in both Louisville, KY and Lexington, KY. Before leaving Target, she was the Team Leader over the Assets Protection department. Schavon received a Bachelor’s degree in Chemistry and an Associate’s degree in Police Studies from Eastern Kentucky University in May of 2008.